Last week I probably went to State Bird Provisions for the last time in a while, as Bon Appetit recently named it the Best New Restaurant in America. It's hard to disagree, as this is a completely new concept for fun/fine dining. I love dim sum, and wonder why nobody ever thought to do this before: California cuisine served dim-sum style. The problem with the fame is that, like the French Laundry, State Bird Provisions is now completely booked up two months in advance. The restaurant does keep some tables open for walk-ins, and on the night of our visit, one table stayed open the entire time. So you might just drop in and take your chances. Just in case, bring a Kindle. 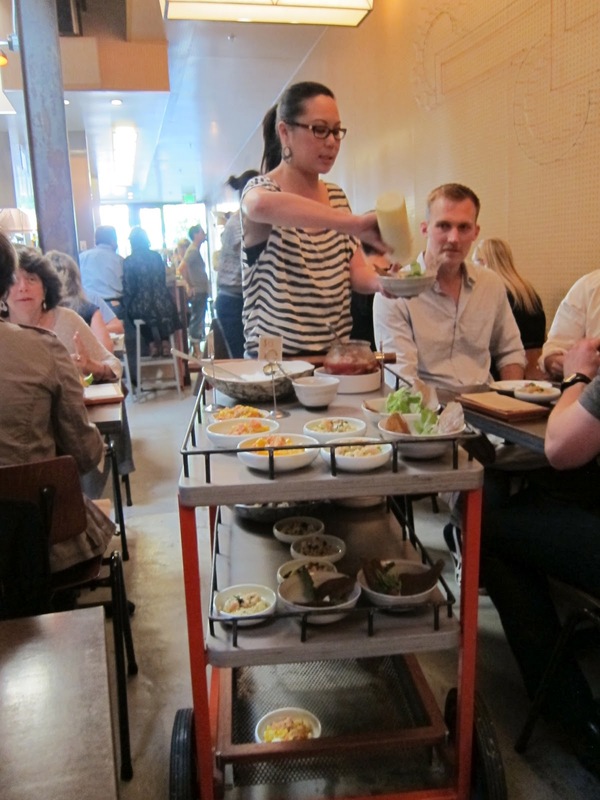 If you do get a seat, the staff brings trays and rolls carts with small plates on them, with the prices displayed on little flags. 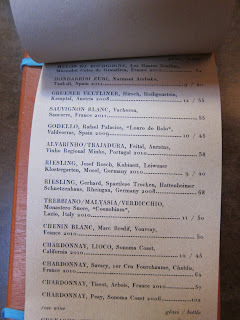 There's never a dull moment, although it's hard to do wine pairing: I couldn't pass up a dish of beef tartare with blistered padron peppers ($8) to start, but didn't get any more red wine-friendly food for another six dishes. In fact, wine service, not the list itself, is the restaurant's weak point. Food is in front of you as soon as you agree to it, but a glass of wine can take more than 10 minutes to appear, even though the restaurant has only 56 seats (14 tables and a counter) and plenty of staff. But what a fun place this is. You can sit on a bar stool overlooking the open kitchen and watch gregarious chef Stuart Brioza tweeze the finishing touches on dishes, when he's not coming out into the restaurant to shake hands with guests. Brioza and his wife Nicole Krasinski, a pastry chef locally famous for not-particularly-sweet desserts have created a narrow, nearly unadorned space that balances buzz with lack of pretension. The wait staff echoes the owners' enthusiasm. If you pull out your cellphone to shoot a photo of the food cart, the server will move it to a better angle for you, before explaining the ingredients in each dish again, seemingly just as jazzed about naming the type of pickles with the albacore/lardo spread for the 25th time that evening as if she were calling up a friend to rave about them. Brioza and Krasinski worked at Rubicon before taking several years off to do catering together. They've brought that casual passed-apps, party-at-every-table vibe inside. It's thrilling to not know what exactly you'll be eating, yet unlike with a tasting menu, you have complete Yes or No say over each course, plus there's no sticker shock because the prices are written right in front of you. It's tempting to say Yes to almost everything, as I did on a previous visit with a party of three. Going just with my wife, we had to be more picky, passing up all of the pancakes (the uni one sounded interesting) and ordering only one "commandable," the signature deep-fried state bird (quail), which the chefs are famous for but which doesn't stand out on this menu. The beef cheek curry looked great when our neighbors ordered it; so did the glazed ribs. Next visit. In, who knows, 2014? Best wine of the night was the Hirsch Heiligenstein Kamptal Gruner Veltliner 2008 ($12/glass), a good choice when the food is all over the map. On a previous visit I loved a Seps Estate rosé, lean and crisp and savory, but the wine list had turned over and probably will again by the time you get in. We passed up so many more delicious dishes, even the "world peace" peanut milk ($2) at the end. I guess I'm posting this so other restaurateurs can consider jumping on the Western food/dim sum service bandwagon, since reservations at State Bird Provisions are now impossible. I miss the party already, and that feeling of wondering what exciting new dish might come rolling past. It recaptures for long-time dim sum veterans the thrill of your first few visits, when the range of dishes seemed unlimited and a taste revelation might come on the next tray. Book review: Eric Asimov's "How to Love Wine"